Advertise Your Venue - Free! 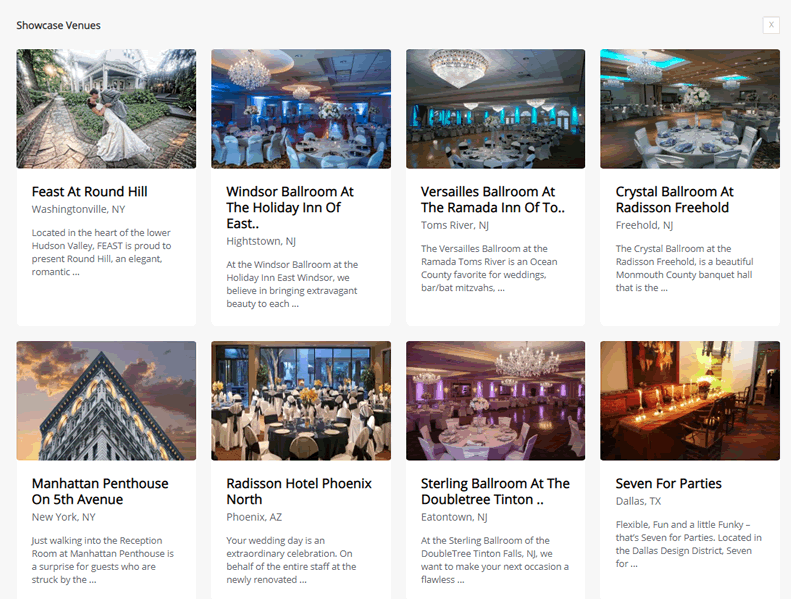 Book more weddings, banquets and private events with a listing on ReceptionHalls. Reach thousands of brides and planners each month. Online since 1999! My venue is already listed. Why Should I List on ReceptionHalls? With so many advertising choices (both online and offline), we understand that your venue advertising budget can only go so far. That's why you can get started with a no-risk, free venue profile on ReceptionHalls that includes photos, promos, videos. We also offer some of the lowest-cost listing upgrades anywhere (starting at $8/month), but that's completely up to you...😉 Our primary mission is to offer high-quality wedding venue options to brides and great banquet halls for party planners. 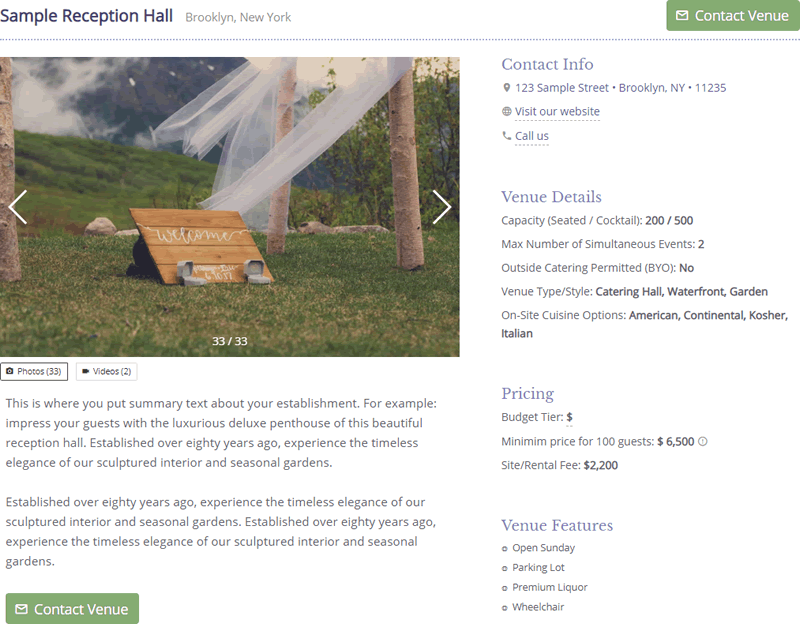 ReceptionHalls is the longest running, online-only, wedding venue directory—we just celebrated our 20th anniversary this year!...whoops, we just gave away our age 😮...In that time we've matched hundreds of thousands of brides and party planners with venues. ReceptionHalls only lists venues, so there's less clicks and instant leads. Your venue could be next! 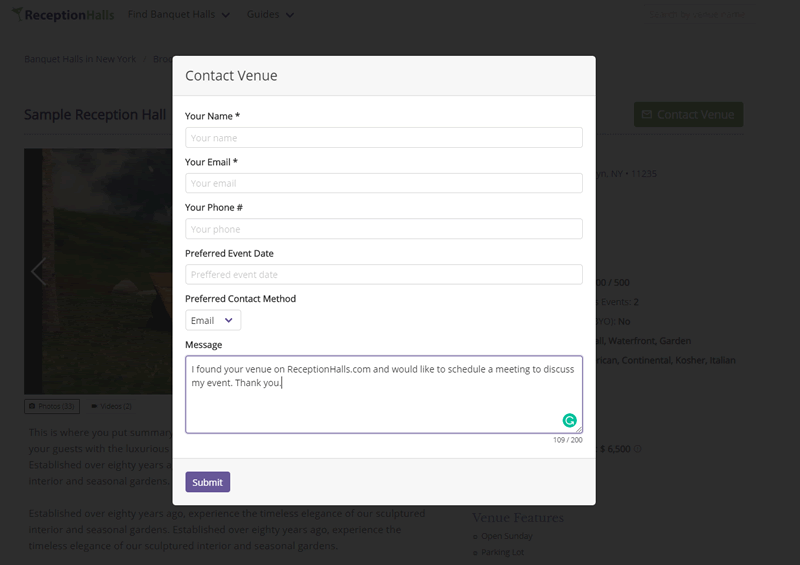 It literally takes just 5 minutes to create your venue profile on ReceptionHalls. You can update your venue information, photos and track your leads at any time. We're a small, family-owned, business and always available if you have questions or want to chat about anything related to technology and marketing your venue. You can contact us any time with your questions or to schedule a quick call. If you need something more than a standard venue profile we can also help. Showcase your venue in style! Clean listings that are easy to read and easy to find. We only list venues, so there's less clicks and instant leads. It couldn't be easier. Venues large and small use ReceptionHalls.com to book more events.